Should I Get a Serger? What Should I Look For In A Serger? In simple terms, a serger is a sewing machine that uses multiple spools of thread to create complex stitch styles. Generally, it binds different kinds of fabric together with the help of the overlock stitch, but there are other patterns used as well. The serger uses three or four stitches together to create the overlock stitch. It is the same type of finishing stitch that you may find on shirts, trousers, and many other garments in your home. 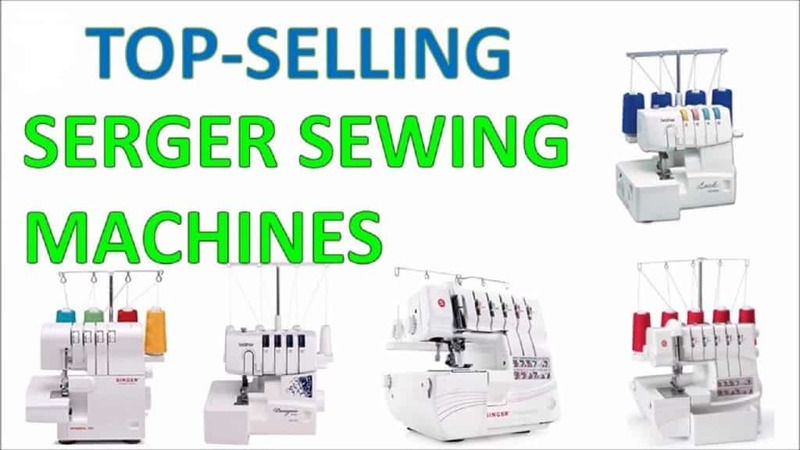 Sergers are more complicated to operate than a basic sewing machine and preferred by professionals. If you are just starting out with sewing, then you may want to get a simple machine. If you have reached an advanced level in sewing, then you may want to go with a serger. The major difference between a serger and sewing machine is the functions that they serve. A sewing machine can do everything from sewing topstitches, design patterns, cover stitches, zippers, and buttonholes. On the other hand, sergers serve a specific purpose. They are used to overlock stitch different fabrics quickly. A serger has a much faster speed of stitching. Even the slowest machine is capable of giving a speed of over 1,000 stitches per minute (SPM). Another major distinction is that sergers don’t just stitch the fabric but cut it just before stitching it into a hem. There is a cutting blade that sits near the needles that are used for sewing. Sergers create an overlocked stitch which isn’t common for sewing machines. This is because serging machines generally sew 3 or 4 stitches at once while a sewing machine only makes just one stitch. Sergers are usually sold with different multi-thread spooling options. They offer more variety in stitch styles and you can create intricate designs and patterns based on your choice. The most common options with sergers include a 2-4 thread option, 3-4 thread option, and a 5 thread option. This type of sewing machine is generally the first serger machine used by professionals. It offers both the basic interlock you get with the regular 2-thread sewing machine but also allows you to use up to 4 threads for more advanced design styles. This type of serger works with 3 or 4 threads. Both types of thread options give a good stretch capability. The main difference is that the 4-thread seam can be wider and stronger than a 3-thread seam. The 5 thread serger is only used by professionals for commercial quality stitching. These machines are quite expensive. However, they offer every kind of seam capability that you could want from a serger. In most cases, three threads are used on the overlocked edge and two are used for the straight seam line. The machine can effectively remove the need for separate seam strength and seam finish stitching. Whether you should buy a serger or not depends on your needs. If you have to complete a large number of projects on a weekly basis and need to deliver high-quality stitching, then you would need a serger. It can work on a large variety of fabrics. This serger adds a lot of strength and design to your projects quickly. It makes the inside of your sewn materials look like they were manufactured in a sewing factory. The stitches from a serger are both stronger and stretchier than a regular sewing machine. Sergers also usually come with a blade the slices off excess fabric during stitching. You can get a perfect hem with no extra cutting very quickly. A serger is both efficient and faster. However, a serger does not completely replace the role of a sewing machine. You would still need a sewing machine to place zippers, buttonholes, design topstitching and facings. When you are looking to buy a serger machine, try to get one with at least 4 threads option as this type of machine makes your production much more durable. The serger should also be capable of different feeds when stitching as this will allow you to work with different types of fabric. Another thing that is a must for sewing is automatic threading as this makes it much easier to set up the serger. The stitching speed is also important. The reason you would want to buy a serger machine is to reduce the time it takes to complete projects. A good serger is capable of making 1,100+ stitches per minute. Lastly, sergers should be easy to understand and operate. Most sergers are complicated machines and an instruction booklet, DVD and color-coded dials will make it easier for you to operate the machine. There are dozens of sergers available in the market, each one offering its own unique benefits. Users can get confused about which one to buy when they are presented with so many choices. It can be easier for professionals to select the right serger when they are clear about their needs and goals. It also gets easier to make the right decision for you when you know the features for each sewing machine. With this in mind, we present a review of some of the better-rated serger machines available in the market today. We have removed sergers from our list that received poor feedback from customers. 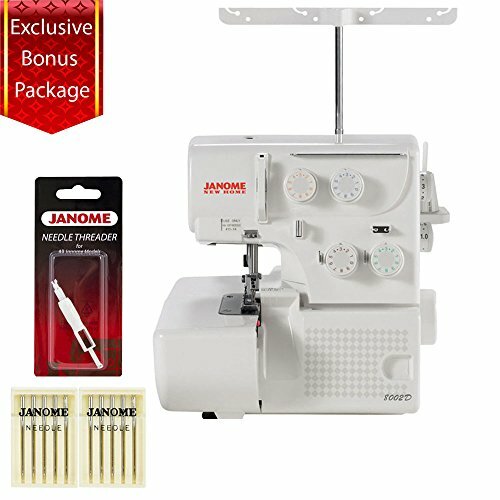 Janome is a recognized brand in sewing machines and they are particularly good at making sergers. The 8002D model is one of their best serger sewing machines available. This is a 3 – 4 thread overlock stitch machine that comes with a differential feed system and built-in rolled hem settings. It has excellent reviews from customers and many users rated it as easy-to-use, low-noise machine. The machine weighs about 14 lbs and dimensions are 14.6 x 13 x 14. It has a color-coded threading chart that is easy to understand even for intermediate users. It comes with a high-pressure foot lifter, quiet operation setting, and an electronic foot. The machine has a differential feed adjustment mechanism from 0.5 to 2.25 and a top speed of 1,300 SPM. 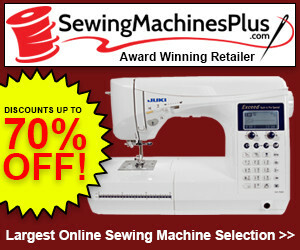 This is easily one of the top ten serger machines available in the market. This serger is smaller and weighs less than some of the other sergers making it a good option for users on the move. It offers 2 – 4 thread options, an industrial-level cutting and tension system, built in hem and sewing gauge and differential feed option. The machine is very stable for its size and has a very low vibration while being used. The automatic blade cuts through excess fabric during stitching and gives it a quick and efficient finish. The machine weighs about 7 lbs and dimensions are 13.6 x 10.6 x 11.6. It has a sewing speed of up to 1,500 SPM and can be used to sew light or thick fabric. The differential feed can be adjusted from 0.7 to 2.0. The Designio series from Brother is aimed at professionals who are looking for a machine that can cut and finish garments quickly without compromising on the design quality. 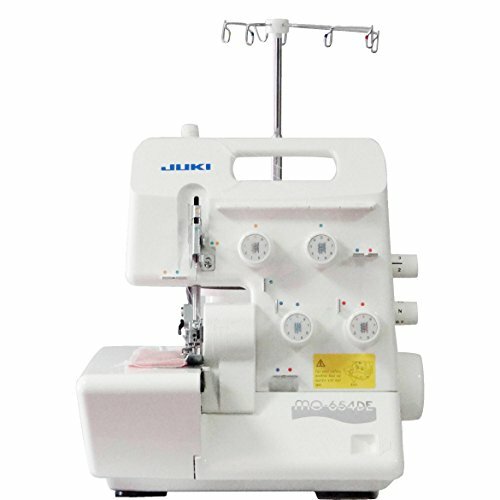 It is a 3 – 4 thread serger that allows differential feed. The free arm is great for different stitching requirements and the adjustable foot pressure can be used for different speed. The machine is relatively easier to use. You will find it very easy to use with its automatic thread-in and bobbing functions. It can be used for a variety of materials including thicker fabric as well. The stitch width can be adjusted between 3mm and 7mm which allows much better design finishes. It is about 18 lbs and dimensions are 15.2 x 13 x 13.2. It comes with the piping foot, blind hem stitch foot and gathering foot. The machine can go up to 1,300 SPM and the feed ratio is from 0.7 to 2.0. Some suggest that Singer is the top brand in sewing and their machines never disappoint when it comes to performance. The 14J250 Stylist II is a champion for serging projects. It offers 2 – 4 thread stitching capability, has a differential feed system, built-in rolled hems and a built-in needle threader for automatic threading. The machine can handle light fabric and even works well on denim. It is a stable, heavy machine and weighs about 20 lbs. Dimensions are 13.5 x 10.7 x 11 and it can make up to 1,300 SPM with ease. It includes differential feed which eliminates the chances of puckering and stretching on different types of fabrics. 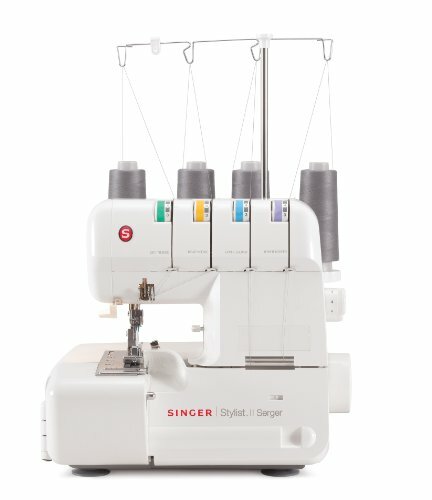 The Singer 14J250 Stylist allows wide open threading which makes it easier to work on big projects to create gorgeous styles. The cutting width gauge allows you to cut and sew materials with consistency. This is another great serger from Juki that deserves mention because of its popularity, particularly with beginner level users. This is a 2 – 4 thread model that was originally introduced a couple of years ago and built a loyal following due to its ease of use and high functionality. The machine has small dimensions at 13 x 10.2 x 11.2 and easy to carry around. It weighs about 17 lbs and generates a high speed of up to 1,500 lbs. 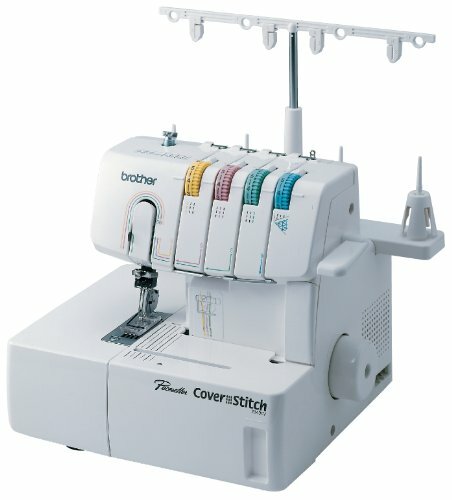 It offers a differential feed for easier sewing and includes a color codes breakaway looper for stitch length adjustment. 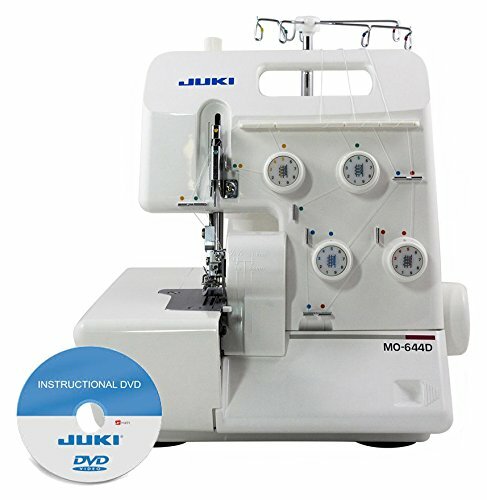 The Juki MO644D has a multipurpose foot for sewing a wide variety of stitches. The powerful knife can automatically cut excess material for perfect finishing. The serger cannot handle very thick fabric but it can be used for light to medium fabric stitching. The 2340 CV is a cover stitch machine and not really a true serger as it lacks the cutting blade. It does get the job done if you are looking to cover stitch cuffs, necklines, and hems. This 2 – 4 thread serger comes with a fast and easy looper threading option. 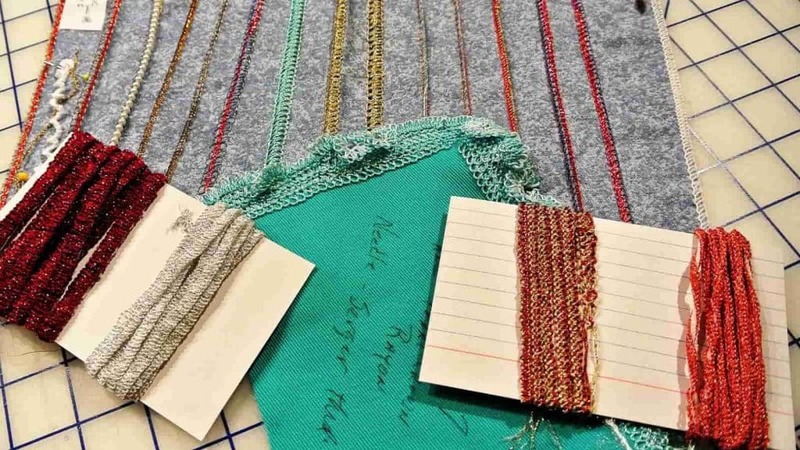 The color-coded threading guide helps to make precise stitching for a high-quality finish. It includes a stitch length adjustment dial that checks the flow of material going through the machine. The machine operates with very low noise making it excellent for use at home. It is also not very heavy and weighs about 15 lbs. Dimensions are 14.6 x 12.5 x 13 and its top speed is 1,100 SPM which is reasonable for a machine of this level. The one main drawback with this machine is that it does not include an automatic tension release system. Singer Professional 5 14T968DC Price: $410.50 "I really love this machine. I am new to sergers though I've been sewing for almost 50 years." This serger from Singer gets pretty good reviews in terms of performance and professional quality stitching. 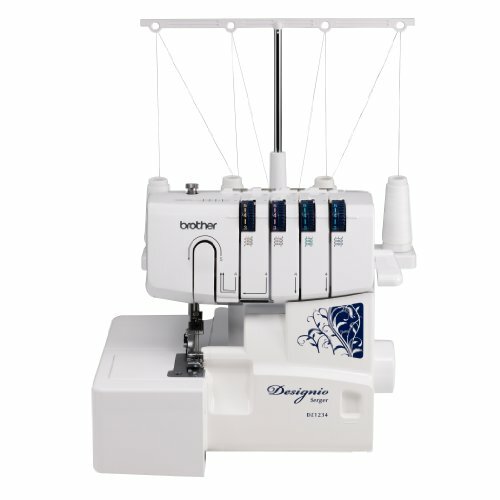 It is a high-end 2 – 5 thread serger machine that offers a variety of stitching options for stitching. The model includes all the options that you’d expect from a professional serger. It comes with a quiet option that reduces serger vibration and noise when in use. This serger has an automatic tension control that makes sewing complex projects easy even for intermediate level users. It has a variety of stitch styles, 4 built-in rolled hems, adjustable stitch length, and width option. 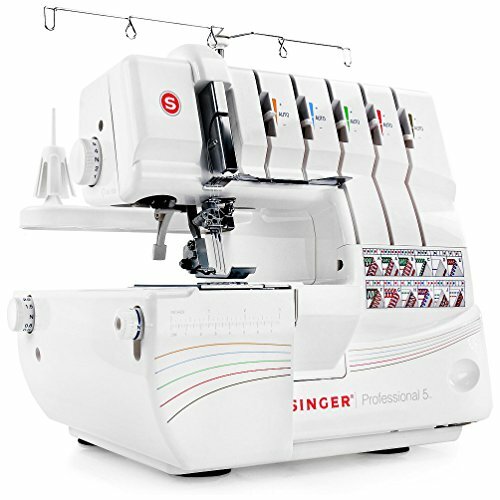 The Singer Professional 5 is one of the few sergers that offers both the overlock and cover stitch combinations. It has a top speed of 1,300 SPM which allow you to complete projects quickly and efficiently. This model from Singer is one of the heavier models and weighs about 21 lbs. Despite the heavyweight, the machine’s dimensions are reasonably low at 13.6 x 10.6 x 12.